Plateaus are an unfortunate fact of life when you lift weights. Without warning, benching 200 or even doing a few more reps suddenly seem like insurmountable challenges. Luckily, adding yoga to your training regimen can help you break through plateaus and become a better weightlifter. Increased Range of Motion. You may know how to perform reps correctly, but do you actually use the proper form? Joint restrictions can affect your form or your ability to extend your arms or legs fully. As a result of your restricted range of motion, you may not build muscle as quickly or reap the full benefits of weight training. Yoga improves muscle flexibility, keeps your joints properly aligned, increases range of motion, and loosens tight connective tissues. When you pair yoga with weight training, you may find it's much easier to swing weights or extend your arms completely. Muscle Flexibility: College athletes who participated in a 10-week yoga study noticed improvements in shoulder flexion as well as knee and hip extension over the course of the study. Weight training tends to shorten muscles, while yoga poses lengthen muscle fibers, increasing flexibility. Better Balance. 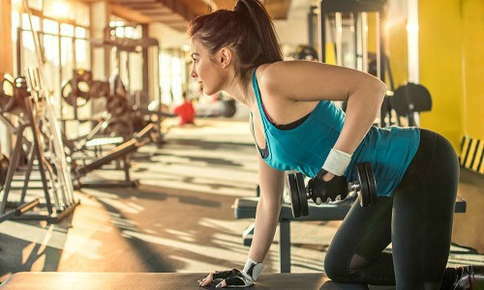 A fall can result in a serious injury if it occurs when you're in the middle of a power lift. Yoga increases flexibility in your feet and legs, improves awareness of your body, and helps you evenly distribute your weight over your legs. Fewer Injuries. Yoga can also reduce the risk of weight training injuries in general. Regular yoga sessions decrease stress on muscles, ligaments, and joints. Weight training targets specific muscle groups in the arms, legs, and torso. Unfortunately, ignoring other groups during training can cause muscle imbalances that may lead to injuries. Unlike weight training, yoga poses target both large muscles and smaller supporting muscles. When all muscles are worked equally, injuries are less likely to derail your weight training progress. Yoga sessions also aid muscle recovery by improving blood flow and oxygen saturation. Endurance Advantages. Do you find yourself lowering the target number of reps midway through a set or hitting the showers much earlier than planned? Building your stamina and endurance may be as easy as practicing yoga a few times during the week. Yoga requires you to hold poses for several seconds or minutes, which is more challenging than it may seem. After just a few weeks of yoga sessions, you may be surprised to find that it's not only easier to perform challenging poses but also easier to push your body during your weight training sessions. Stretching and lengthening the muscles in your torso may also improve your ability to breathe deeply, which can decrease fatigue when lifting weights. Improved Physique. Bulky muscles are evidence of the hard work you've put in during your workouts, but they can give your body an unbalanced appearance. Yoga poses stretch, strengthen and tone the muscles activated during weight training workouts, which helps your body look more proportionate. A Calming Influence. Yoga is just as good for your mind as it is for your body. It decreases stress, lowers blood pressure and anxiety, and improves mental sharpness. If you're feeling a little amped up after a successful weight training session, spending 15 minutes performing a few yoga poses offers a simple way to de-stress. Yogic breathing and meditation, essential aspects of your yoga practice, enhance the calming effects of yoga by improving mindfulness and your sense of well being. Are you ready to give yoga a try but aren't sure where to start? Our yoga instructors offer step-by-step instructions that will help you master basic and complicated poses alike. Contact us for information on joining one of our classes.